In order to be successful in any cases of professional tasks of interception, it is indispensable to have the right equipment at hand. Such basic equipment which is supplied with this set of PKI 2970 is the absolute minimum which every governmental organisation must have. It has been developed in close co-operation with our customers from worldwide government departments and for completing their request for solutions of every monitoring tasks to be undertaken. PKI 2970 as a complete assembly results from our more than 40 years experience and our continuous research and development providing the latest state-of-the- art at any time. With this kit you are well prepared, even in cases of unexpected tasks. There is no doubt that the content of this kit can be adapted to our client’s requests. Therefore – and this is our long lasting philosophy – we always try to stay in a very close contact to the customers and personally discuss their needs. By this, a final content, beside the standard execution can be determined. The standard kit contains a comprehensive number of different transmitters for room monitoring powered by mains, telephone lines and battery operated listening devices (even through walls by means of electronic stethoscope with or without transmitter). A professional receiver, a digital recorder and a microphone connected by a cable of 100 m length (other lengths are available upon request) plus a directional microphone complete the whole set, which is supplied in a solid carrying case for secure storage and outdoor handling. 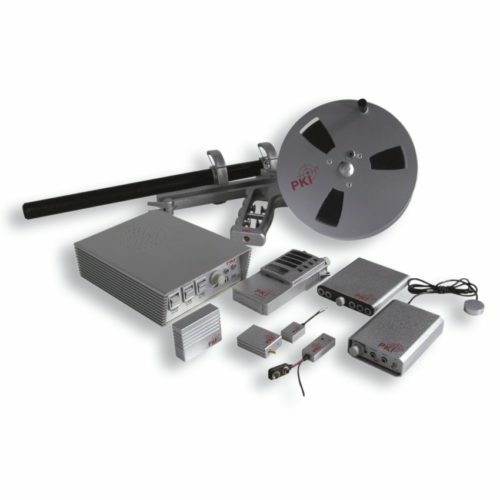 This kit contains a comprehensive number of different transmitters, receiver, digital recorder and microphones. For full technical details of each item please see the relevant item number.